Installation is relatively easy. Test the fan to see which way it blows, and which way you want it to blow, keeping in mind that the cathode can't be on the same side, as the bracket uses those mounting holes. If the fan blows in the wrong direction, swap the bracket to the other side, grip a nut (on the fan, silly) and unscrew the screws with a screwdriver. Removing the bracket to fix it to the other side of the fan. Now screw (or in my case, use the cool plastic thingies that Lian Li supply with their cases) the fan to where you want to mount it. 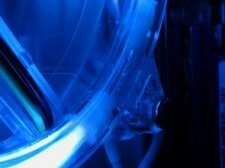 Plug it in to power for the fan (motherboard or power supply, take your pick), plug the cathode ring into the inverter, plug the inverter into the switch, the switch into the power supply (whew) and you're done. How does it look? Well just like my other normal-length CCFL - it's danged bright! 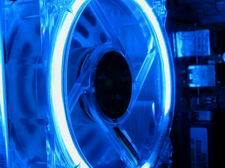 Even though it's smaller cathode than a full length, it still emits a lot of light. In the first picture above, a halo of light is clearly visible on the back wall - even through the rear case grill. Thankfully, if it's night and you're trying to get some sleep, you can turn off the fan (and whatever other cathode you have plugged in) easily with the expansion-slot switch pictured above. Thankfully, a delta this is not - the fan doesn't make a lot of noise. I'd say the noise is comparable to all of the other transparent fans I've seen (and it wouldn't surprise me if they were in fact the same fan). 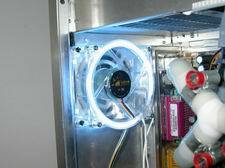 In a watercooled system, noisy fans are obvious and not easily drowned out. I can hear the fan, but it's not enough to annoy me. And it thankfully doesn't have the irritating pitch of a delta or other high-speed fan. And now - showing off what the fan does best - look good. 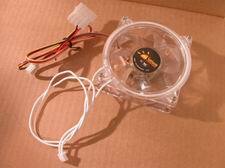 Below is a gallery of pictures of the fan mounted in my Lian Li PC-65. With a watercooling setup and your standard stock of HDD's and CD/CDR/DVD drives the case is pretty packed, but the fan does a decent job of lighting things up. 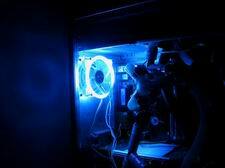 In daylight, the visibility of the fan is just like a "normal" cathode, so the CCFL fan doesn't suffer as badly as LED fans. 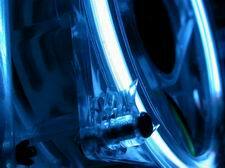 The major factor here is that LED light is more directional, whereas cathodes spread light all around. The only real difference between this and "normal" cathode is the length of the tube and compact size. 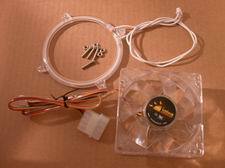 A view of the fan on before installation. 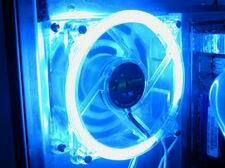 Some more shots of the fan in the case. 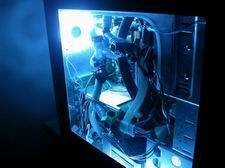 The first shot here also has the fan's inverter powering my cold cathode (located at the bottom of the case. Another misc shot, and a closeup. 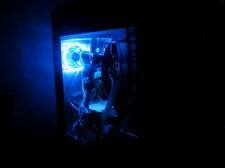 Overall - I've found the fan to be quite effective at lighting up the case. 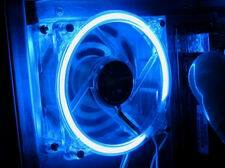 With LED fans they're more decorational with directional light focusing exactly on what they're pointed at. 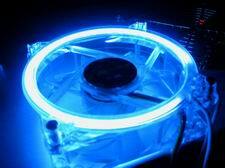 But with the CCFL fan you can actually light up the inside of your case and not just the fan. If you've got space problems in your case (like me - check the messy wiring in the pictures) then you'll find the CCFL fan very useful. 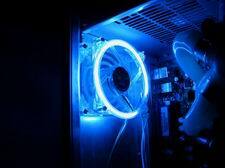 For $29 they're about the same cost as buying a transparent fan and CCFL separately - but you won't have the dual power inputs, the switch on the back, the space saving or a cold cathode which can be placed nearly anywhere. 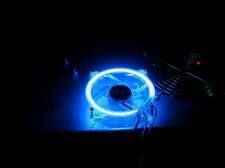 PC Range provided the review sample and sell the blue CCFL fan here for $29. Recommended.